Turtle Moon Studios. Susan Shie. Turtle Trax 5-21-01. This is our cat Meeper, who was very thin and sick for several years, and who's now getting healthy and fat again, at almost age 13! You've come a long way, Baby! Topics in this diary: Artsweek at Garaway Schools, April Turtle Art Camp, Austin Textile Arts Group class, stuff at home, our greeting cards are here to buy! When my friend Maxine was here in March, we did some airbrush painting together. 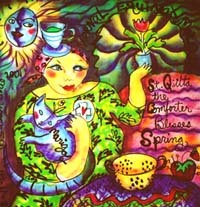 This is my "St. Quilta the Comforter Blesses Spring" painting. It got kinda dark and murky, as Max was still painting after I thought my piece was done, so I kept adding to it, so I could keep painting, too! I haven't quilted it yet, but I want to. Don't you think she looks kinda French here? AQN (Art Quilt Network) met in Columbus at the end of March, and I attended without Jimmy for the first time in over ten years! He was just very busy with his leather work. 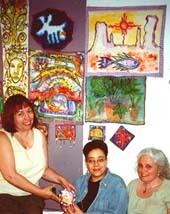 So I roomed with Michele Merges Martens (seated left), Of Watervliet, NY, who's one of us three GREEN QUILTS workers, along with Robin Schwalb and me. You can see art by Michele, me, and Joyce, displayed on the white boards behind us. The room was full of art quilts by over 40 members of AQN, who attended that weekend. Right after AQN, Jimmy and I taught at Garaway Schools' Artsweek 2001, an hour from home in Sugarcreek. Every other year it's the high school and junior high artsweek, so we had seventh to twelvth graders in our two classes. Around 80 teachers give classes mornings and afternoons, in nothing but art subjects all week! All other classes are suspended til this event is over!!!! Our two classes were Painted Library Furniture and Sugarcreek History Mural Paintings. In the above photo, we took a field trip the first afternoon with the history murals class, with our helper and local historian Rev. Welton Stein. Here we're all standing in the first cemetary of the white settlers of the area. That afternoon Welton took us in a school bus all around Sugarcreek, to tiny towns, crossroads where important buildings had once stood, and even a museum in the basement of a church! It was quite the mini education for us and for the students who had grown up in that area, as well! Between Welton and Jimmy is Penny Sterrett, our teacher/helper for the class. Every art class that week had both an artist teacher and a regular Garaway teacher, who helped the artist and had the background of knowing all the kids in the class. This was the first morning of our furniture class. These girls are sanding the furniture they'd brought in to paint. Each student had to have read a book in their reading level, done a book report on it, and found a piece of furniture in good shape, on which they would create the illustrated book report. A few of the kids brought in furniture made by their parents, especially for this project! And there were a few wonderful antiques! After a day of sanding and priming the furniture, we spent the next four mornings painting and writing on it. Sue Gerber was our teacher/helper for this class, and we had 19 students in this group! This was probably the third day of artsweek. Nicki was busy putting really elaborate paintings on her foot locker, to illustrate her book. She had the most area to cover with art, and she worked diligently, nonstop, making a truly wonderful piece! Back in the afternoon class, at the end of the week, Laura, Brent, and Nick are putting protective varnish on their paintings. We used acrylic paint in both classes, and the pieces at left were all on 24" square plywood boards. Showing historical aspects of all the little settlements around Sugarcreek, as well as that city itself, they will now hang in the Sugarcreek Museum. The last day of Artsweek, we put all the artwork made that week into the gym for display. Here are some of the furniture pieces. 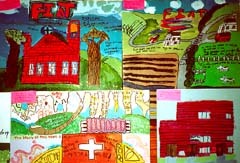 Here are some of the mural paintings. This photo contains Nicki's foot locker as well as some of the mural paintings. This is our own piece of furniture I painted in the morning class. It's a silverware box, painted to illustrate my FUTURE book, "The Kitchen Tarot," which won't be written until after I make all the artwork for the actual cards of the deck! So don't hold your breath on the book! But at least now I have a box to put my notes into! At this time, the big plan is that the image for the Temperance card in the Major Arana will be the big Sunbeam Mixmaster. Only, it would also be nice to have it be The Sun! 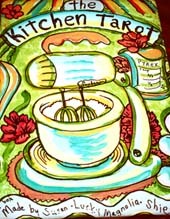 Actually I only decide exactly which card will be which kitchen object as I come to that card to work on. This has worked out well, so far. When "Issie's Trailer Court" is finally done, I can then start the next card, which is The Cream and Sugar / The Lovers. One more thing about Artsweek, before we leave the subject. Sugarcreek is a primarily Mennonite and Amish community, with its first settlers being primarilyAnabaptists and Swiss in heritage. Although many other people, outside this culture, have moved into the area, it keeps its Swiss/Amish flavor and attracts many tourists. It's a very peaceful and pretty town. If you decide to go exploring in mid Ohio, be sure to visit this area! After a little time in between classes, we had another camp here at home. Turtle Art Camp April 18 to 24 this year included three students. From left: Anny Walks Softly from Louisville, KY; Kim Nickens from Pittsburgh, PA; and Nancy Theriault from Providence, RI. 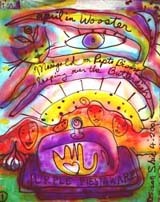 Three artists from big cities hit little old Wooster with a bang! We had a great, high energy week. This photo is actually from the last night, in which their project was to create one piece by using all or most of the art made during their week. Part of the composition got cut off in my photo though. Sorry! It was a big, loose design, with my Earth Day ribbon running down the middle. 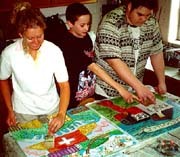 Each student had then to learn how to sew the panels together in the Lucky School of Quilting style. As ever, I think this exercise is the best thing in the whole class, as the students have to do a lot of cooperating to create the "quilt" they'll be sewing together in theory and a little by hand for real. This was the winner of the prize for being the most unusual composition to date, of these camp final projects! Here are the tee shirts made in camp that week. Two are flipped around, so we could photo both fronts and backs at the same time, but when they were being created, all were turned the same way. 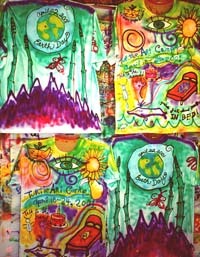 Images of special interest to this camp are the birthday cake, the bed, and the Earth Day globe. Oh, and the asparagas! And it's growing up out of purple mountains' majesty, not purple flames! Nancy, Kim, and Anny are now pretty savvy with the airbrush, having completed their tee shirt project! Nancy's planning to buy her own, as campers often end up doing. This is one of four paintings I made during camp, as demos of Deka and airbrush work. I did a set of four "Purple Fiesta Ware Butterdishes." That's Marigold the cat, jumping over the butterdish. That week she was sick and had to take medicine that looked like Pepto Bismol. Ugh! But she got well. As we promise, when you come to Turtle Art Camp, you get to choose a cat to be your own for the week! Anny and Tulip (Tulipetra Mayfly Honeypie Shie) chose each other. Tulip is the studio cat in general, but she also loves whoever sleeps in our old bedroom. Anny was IT! Luckily she loves cats! And she had suitcases, which are one of Tulip's big fascinations! Nancy's birthday was April 21, during camp, and Kim's had been April 15, so we got to have a good party for them! This just had to become a photo, a testimony to how important it is to wear your respirator AND make a fashion statement! All three students this camp were very good about wearing respirators. I know some people get claustraphobic in respirators, but that's better than inhaling art materials' fumes! Bravo, brave campers!! You look marvelous, dahlings! My dear friend Bridget O'Connell sent me a ribbon to do some art to, for a project she was cooking up. I had figured a ribbon would be about a foot long, so not a big deal! Here it came in the mail: a 15 foot piece of white fabric!!!!!! So, during camp I airbrushed it on Earth Day, and filled it with all the earthy images I could think of putting onto it. The picture I cooked up that I repeated over and over was a tree with eyes in its top. I alternated these with other lifeforms and words of healing and balance. Then, after all the pictures were drawn with black paint, I added color. I think it was done in an hour, including heatsetting it! Wow! I've got to paint more and sew less, I swear!!!!! !